I organizes a winter hike on the head of the Mont de Vorès. 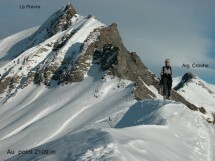 From Megève (75 km from Geneva) this Sunday, January 29th. After a first part in the woods, we reach a view of Mont Blanc and Col Véry. Part walks on the Tour Beaufortain. The Mount of Vorès is located 200 m above. The summit at 2067 m.
A gradient of 800 m and a distance of 10 km. A gradient of 800 m and a distance of 10 km. Walking time: about 5 hours.